In July 2009, a study funded by the Centers for Medicare and Medicaid Services revealed the Heart Hospital of Austin as the leading hospital in the United States for treatment of a heart attack. From prevention to recovery, Heart Hospital of Austin is uniquely designed for the diagnosis and treatment of cardiovascular disease. Physicians, staff members, and technological resources are dedicated to delivering meticulous patient care. As No. 1-ranked heart program in Texas, six years in a row as ranked by HealthGrades, this state-of-the-art facility is on the cutting edge of today's innovative cardiovascular care. The 58-bed Heart Hospital offers a full range of cardiac services, including a 24-hour full service emergency center. The award-winning facility also utilizes new technologies and advanced treatment options to provide patients with opportunities they might not find at other facilities. Hosting one of the largest private practice-based clinical research programs in the nation, the Heart Hospital of Austin performs a wide spectrum of research, which includes new drugs, as well as the latest devices and new indications for existing therapies. For more information of what this state of the art Heart Hospital offers, please visit their Website above. 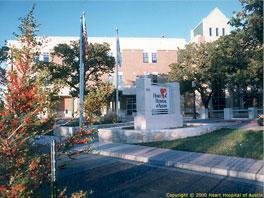 Website visitors interested in HEART HOSPITAL OF AUSTIN were also likely to be searching for these additional terms.